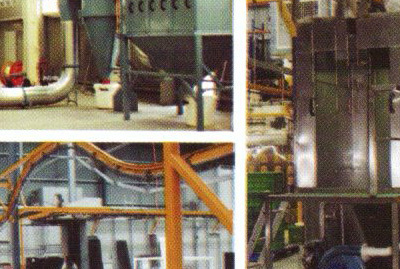 Choosing the right powder coating equipment manufacturer and supplier in Melbourne doesn't have to be a daunting task. Actually, the shortlisting process becomes child's play when the likely candidates are judged on one key strength. We're referring to reliability, a capacity for consistently offering the best services. In order to realize this unwavering premise, we need a mission statement, a means of clarifying some fundamental values. Like any other thriving metropolis, Melbourne is based on a robust infrastructure. That sturdy city framework uses powder coating establishments on a daily basis to strengthen just about every conceivable object under the sun. A reliable supplier diligently keeps one virtual finger on the city pulse while sourcing the best-branded gear in the industry. In doing so, the equipment is sure to operate consistently and perform productively at all times. Again, a diverse customer base occupies this city, so the role of the dependable manufacturer here is to accommodate these city-wide swings, especially when they involve surface finishing projects. If reliability and consistency are the twin backbones of the mission statement, then quality workmanship has to be the shaping influence. Quality is a metric that's initially created by the powder coating equipment manufacturer and supplier. This expertly endowed service matches a cost-effective solution to the business concern, one that ideally suits the buyer and his work base. Ideally sized cubicles, ovens, and electrostatic systems then match the scale and intent of the business. Thanks to this tailored approach, a turn-key facility, as equipped by an expert supplier, will consistently meet its daily processing target. 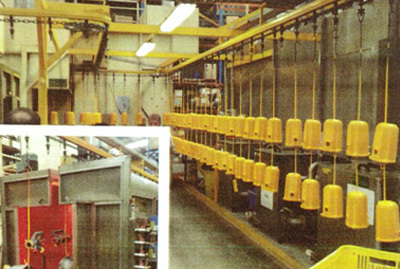 A meticulously operated powder coating facility focuses on processing quality and finish inviolability. Textures are efficiently applied while engineering acumen pairs with artistic vision to bake perfectly veneered parts. 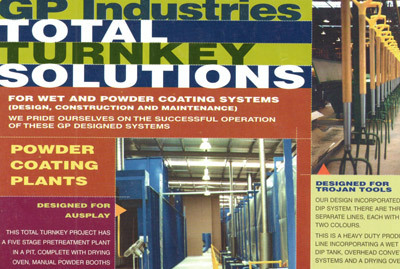 The role of G.P.Industries Pty. Ltd in this high-fidelity setup is to create the ideal baseline, to manufacture and supply the gear that ensures product consistency and performance accuracy. From here, fledgling businesses can prosper and experienced workshops can expand because their equipment is quality-assured. The role of a reliable powder coating manufacturer and supplier in Melbourne is clear: we enhance the city by promoting high-end finishing solutions. We arm powder finishing workshops with the right equipment for the job. In leveraging over forty-five years of expertise and experience, we believe the G.P.Industries Pty. Ltd approach will invariably result in a formidable foundation, one that benefits every powder coating operation that's wise enough to call upon our services.